I mentioned about Positive Psychology and getting to a north of neutral state in a previous blog. The ingredients to live the life of our dreams and the method to plan for it was at the essence of the conference. Participants learned from the wisdom and knowledge of people who have mastered certain aspects of life or have come to live fulfilling ones. Through keynote speeches, panel discussions, and break-out presentations, participants learned about areas in which they wished to grow. Well-being and a life of flourishing are among the key objectives of Positive Psychology. The science helps give a researched based language to the concepts that a conference like this presents. Positive Psychology teaches the idea of moving to a state where one is not just seeking to alleviate the pains or weaknesses in life (neutral state), but finding the tools and strengths from within to push oneself from a neutral state to one that is north of neutral and extraordinary. There was no doubt that the more than two hundred people at the conference from all over the country, different parts of the world, various walks of life and diverse backgrounds were there for a common reason - to grow and move forward in life. This reason for being there is evidence of what is known as a growth mindset – the belief that the development of intelligence is possible, and that effort leads to mastery. The ability to view life as full of opportunity and to believe in one’s ability to achieve goals are all elements of a growth mindset. A fixed mindset, on the other hand, is one where people see themselves as victims of situations where possibilities do not exist. When they fail, they see themselves as failures instead of just having failed in one activity, picking themselves up and moving on. They leave no room for growth. Not at 1Life Fully Lived. Attendees were there to open up possibilities for themselves and for others. They learned how to embrace challenges and be inspired by other’s success. Behaviors right in line with Positive Psychology. Not only was the conference packed with a lot of information and learning, but also with injections of humor, dance, music, food and lots of bonding. It was a joyous experience, to say the least, with positive emotions plenty abound. Everyone had an attitude of giving and an open mind to receive. The information and knowledge that the accomplished speakers such as Jon Vroman of The Front Row Factor, or Julianna Raye of Pop Go Zen, or Rock Thomas of Rock Thomas International provided were nothing short of inspiring. The role of positive emotions to increase well-being behaviors has been thoroughly researched by psychologist Barbara Fredrickson. According to Fredrickson, to the extent that wellness practices produce positive emotions, our brains create non-conscious motives which cause us to want to indulge in the behavior again, creating an upward spiral of more positive emotions that in turn broaden one’s awareness and builds personal psychological, intellectual, social and physical resources. To some extent, I witnessed this play out in the span of just two days at the conference. Psychologically, I saw participants feel motivated and burst with optimism. People got inspired to launch businesses, change habits, write books and much more. Socially, the bonding between people and the development of relationships was visible; we were surrounded by it the entire time. Intellectually, I saw firsthand how people were grasping concepts and were open to learning. Physically, the positive emotions I am sure relieved a lot of people’s stress and aided in the release of oxytocin. If not, the mindfulness keynote by Julianna Raye would have gotten them there. Positive emotions are an important part of Positive Psychology and the conference provided plenty of them. The achievement of goals was among the topics most discussed in the conversations that I had with participants. Many had found motivation or the pathways to help realize them. Positive Psychology speaks to the importance of achievement in life and how it contributes to a life of well-being. Many things we do in life are to accomplish things, and the way we create goals and take steps to meet them can have a direct bearing on the quality of our lives. Setting goals and holding accountability was an essential part of the conference. Never in my life have I met a person, so driven and inspiring as the founder of 1Life Fully Lived, Tim Rhode. A man whose purpose is to help others. Tremendously successful and now in a position to give back to society he is capitalizing on his strengths. He is using his past business experience, ability to connect people and phenomenal network to help others aspire towards and start living their dreams. He personifies the fact that other people matter. He does this by not helping directly, rather taking a coaching approach where he helps people build their own strengths and become resilient enough so that they can realize their dreams. In my mind, there is no better way to give back, and this personifies the simplest definition of Positive Psychology as per Dr. Christopher Peterson, that other people matter. 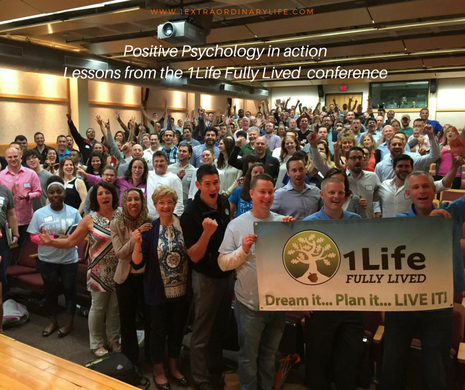 It is easy to attend an event like the 1Life Fully Lived conference and be in a state of being where one is genuinely happy, eager to learn and develop, care for each other and where everyone is on his or her best behavior. Positive Psychology allows us to take a step back and review why this is possible. Contact me if you would like to learn more about how you can use Positive Psychology to enhance the way you experience life.